Running the Euclid through its paces. Most printers do not have a Z axis such that they can do this. In short, 3D printing, additive manufacturing and robotic fabrication are revolutionizing our means of creation as well as the concepts and techniques we traditionally use to conceptualize the process. 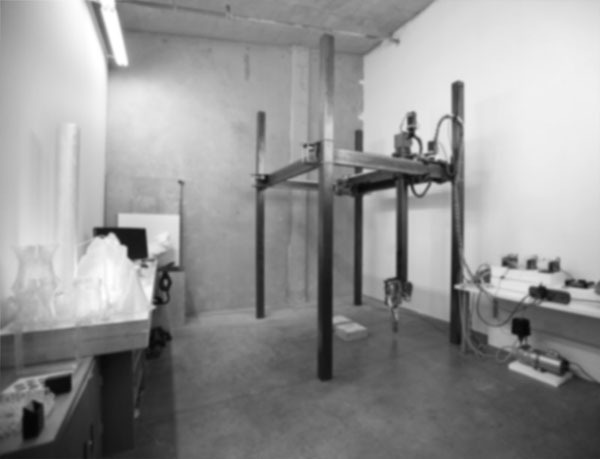 The Bot Laboratory will be 3D printing architecture using the tools initially realized by Zachary Schoch and hopefully with a great deal of contributions from others. The reality of it is that 3D printing really big things is not hard at all once you know how to do it. Our biggest goal is not faster, bigger or cheaper (although those are important here as well) it is to contribute to the discourse of these new ways of making that are already transforming our society. The Bot Laboratory was formally started in 2013 by Zachary Schoch, but the research it is based on has been underway since 2011 when Zach was completing his masters thesis at Sci-arc in Los Angeles California. This is how the lab looks when it is really clean. Not shown here is the print bed which is currently installed. If you would like more information please feel free to contact us. If you are a normal person and don't particularly like using forms like the one below you can also email Zachary Schoch directly at xahkary a t gmail dot com. If you are spidering software please use the form below to alert me when you have the ability to read my poorly obfuscated email (which will undoubtedly be soon).